The first round of results are in for the two Seattle Public Schools levies that were the only local measures in today’s election. The next count is expected tomorrow afternoon. The biggest West Seattle projects on the list for the six-year BEX V levy are a rebuild of Alki Elementary and an addition at West Seattle Elementary. Seattle Public Schools – closed Wed.
Highline Public Schools – closed Wed.
Explorer West Middle School – closed Wed.
Westside School – closed Wed.
Holy Family Bilingual School – closed Wed. Summit Atlas – closed Wed.
South Seattle College – both West Seattle and Georgetown campuses closed Wed.
Seattle Colleges‘ other campuses – 11 am start Wed.
University of Washington – 9:30 am start Wed.
Seattle University – open Wed.
Fauntleroy Children’s Center – closed Wed. Bright Horizons/West Seattle – open 10 am Wed.
206-293-6302 text or voice – thanks! 4:11 PM: From transit to trash (see the links above), there’s hope that warming weather will enable many services to get back to normal. We’ll cover the afternoon-into-evening developments and updates here. 6:16 PM: As we reported earlier, Waste Management announced that it expects to pick up Seattle Monday AND Tuesday customers tomorrow. We are in the latter group and just got an AlertSeattle message reaffirming tomorrow’s pickup plans (which are on the SPU website too). 6:53 PM: We’ve been watching various sources for Seattle Public Schools‘ decision. Here it is – closed tomorrow. … More route details are available (here) and additional snow reroute information will be posted online for customers by Wednesday morning. We still anticipate operating more than 90 percent of Metro routes, with snow reroutes and some peak service reductions in effect. · Seven routes will have all trips canceled on Wednesday, Feb. 13: 71, 78, 200, 237, 268, 308, 309. · Thirteen routes will have some trips canceled on Wednesday, Feb. 13: 9, 29, 37, 125, 201/204, 208, 224, 243/244, 316, 330, and ST 540. · All Metro morning and afternoon peak commute routes will experience some level of reduced service: an estimated 3 out of every 4 buses will be in service as we work to ramp up service, respond to road conditions and repair our fleet and recover. · Riders: To find out if your particular trip is canceled on Wednesday, text your stop ID to 62550 or check Next Departures on the Puget Sound Trip Planner or its app. 8:22 PM: A few more schools have announced delayed openings. … Here’s an updated alert about the West Seattle Water Taxi returning to its two-boat schedule, also mentioning that Ride2 will NOT operate tomorrow. 10:21 PM: Though there’s been concern about the slush/melted snow refreezing, so far we’re holding in the upper 30s. Prop 1 is a three-year levy, Prop 2 is a six-year levy. Each link above takes you to official info including pro/con arguments and full measure text; the school-by-school project list for Prop 2 is here. 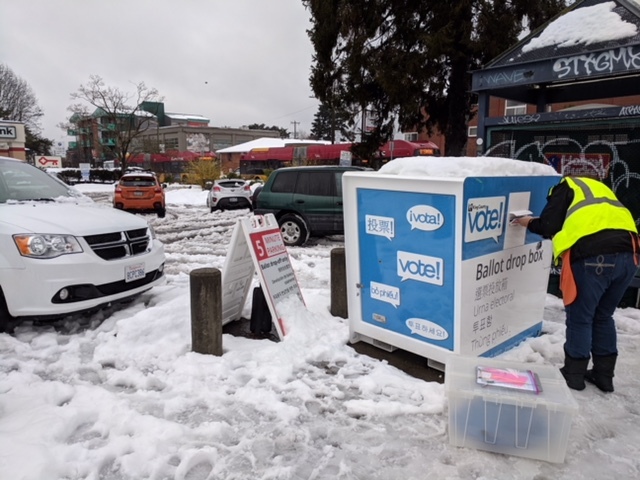 The photo above is courtesy of Michelle, taken at the Junction dropbox (we had been there a bit earlier); you can drop your ballot there (Alaska just east of 44th), or at the High Point (3411 SW Raymond) dropbox (among others – here’s the full list), or get it in the USPS mail. If you absolutely can’t, the county invites you to call 206-296-VOTE; they might even be able to pick yours up – Toni just sent a note saying she’d called and they were sending someone over. 1:19 PM: Again today, Mayor Durkan gathered city department heads at the Emergency Operations Center for updates on how their teams are dealing with the “historic challenge” – as Seattle Public Utilities general manager Mami Hara described it – of providing service after record-setting snowfall. Above is Seattle Channel video of the briefing. 2:51 PM: Waste Management – the city’s contractor – is now saying it expects to pick up Monday AND Tuesday customers tomorrow.